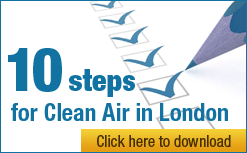 Clean Air in London (CAL) published the results of its ‘Investigation into Government’s failure to control carcinogenic diesel exhaust’ on 3 April 2013. As part of that investigation, CAL uncovered the widespread commercial modification, removal or tampering with factory-fitted diesel particulate filters (DPFs) and the Government failing to properly address the problems arising. CAL is now publishing the results of its further investigations. Policy Exchange has estimated that diesel vehicles are responsible for over 90% of dangerous airborne particle (PM2.5) emissions from vehicle exhaust in London. PM2.5 consists of microscopic solids or liquid droplets that are so small they can get deep in the lungs and cause serious health problems. PM2.5 is linked to a variety of problems, including increased respiratory symptoms such as irritation of the airways, coughing, difficulty breathing, decreased lung function, aggravated asthma and premature death in people with heart or lung disease. The World Health Organisation classified diesel exhaust as carcinogenic for humans on 12 June 2012. DPFs are fitted to vehicle exhausts to mitigate the health effect of diesel exhaust but a practice has grown up of removing or deliberately damaging the filters. This may be to restore performance of a vehicle where the filter has become blocked rather than replace the filter or have it cleaned. Some businesses appear to be offering this as a service, advertising openly, in particular on the internet. CAL understands that driving a vehicle which has been tampered with is an offence contrary to S42 Road Traffic Act 1988 and S91 Road Traffic Offenders Act 1988 by virtue of breach of Regulation 61A Construction and Use Regulations (SI 2000/1544). In CAL’s opinion, removing a factory-fitted DPF is either a substantive or inchoate offence too. CAL has pursued its investigation since April 2013 by contacting the Government, the Association of British Insurers, the European Commission and others. CAL estimates that one garage removing four factory-fitted DPF’s per day might remove up to 1,000 in a year and that scores or hundreds of garages or mechanics may be doing this work. CAL is also concerned this issue may extend beyond the removal of factory-fitted DPFs to the widespread tampering, modification or removal of other engine, exhaust or emissions control equipment. The scale of the problem is unknown and there are rumours it might involve the export of used DPFs from the UK to Germany or elsewhere to aid cheap compliance with low emission zone standards in those countries. Further, the removal of factory-fitted DPFs may explain in part the reported ‘underperformance’ of recent diesel exhaust emission standards in the real world. Such concerns are speculation at this early stage of CAL’s investigations. CAL is calling on the Secretary of State for Transport to accept responsibility for the Government lighting this time bomb under motorists and public health and resign immediately. “They’re called ‘particle traps’ because they are designed to remove many of the most dangerous particles from carcinogenic diesel exhaust. “By failing to warn motorists and stop the industrial scale removal of factory-fitted diesel particulate filters, the Government may be letting tens of thousands or hundreds of thousands of motorists drive illegally, face losing their car insurance and risk being found guilty of the criminal offence of fraud – many without realising it. Perhaps worse, the Government is turning a blind eye to this crisis and taking us back to an age before environmental standards when raw and carcinogenic diesel exhaust smothered our streets. “We need advice, action and investigations urgently by the Department of Transport, Department for Environment Food and Rural Affairs, Ministry of Justice and police to protect motorists, those exposed to diesel exhaust and others. As CAL understands it, the typical ‘remapping’ of a vehicle makes the engine control unit (ECU) ‘believe’ that the diesel particulate filter (DPF) is present (so that the warning light on the dashboard goes off) but does not improve the emissions. It is possible to change the emissions performance slightly by re-tuning/remapping a vehicle but CAL believes such changes could not match the emissions reduction achieved originally by the factory-fitted catalytic converter or DPF (which removes more than 95% of particulates). DPFs may increase fuel consumption slightly (and thus overall CO2 emissions) – perhaps by 1% or so. However, this is done in order to achieve huge improvements in air quality by reducing particulate emissions (and to meet the overall European emissions regulations for type approval). Five different types of those emissions are regulated. A vehicle might pass the current MOT test if a vehicle has been ‘remapped’. However, the MOT test is a very unsophisticated smoke test and modern diesels may pass this test with or without a DPF. In summary, CAL believes that once a factory-fitted DPF has been removed and not repaired or replaced, the modified car would not meet the emissions performance at the time of manufacture. Logically, if such a thing were possible, the manufacturers would not fit DPFs in the first place. “It is the responsibility of the vehicle owner to ensure that their vehicle is legal to drive and roadworthy, and to declare it as such when applying for or renewing insurance. Applying for or renewing insurance knowing that the vehicle is illegal or unroadworthy, would amount to misrepresentation and potential fraud. Terms and conditions of motor insurance policies normally specify that the vehicle must be registered in the UK (or in the process of being registered), and that the vehicle is roadworthy. No insurance would be offered or renewed if the owner declared to the insurer that the vehicle was illegal to drive/unroadworthy. “In the event of a vehicle becoming unroadworthy and/or failing an MoT, insurers would expect owners to remedy defects and obey the law by not driving the vehicle (as noted above if owners do not do this they would breach the terms and conditions of the policy). The need to notify an insurer should therefore not arise, unless as a result of the defects the policy holder is temporarily or permanently taking the vehicle off the road and wishes to suspend or cancel the policy. “Insurers require notification of modifications to the vehicle which change the vehicle’s standard specifications. Clearly any such modification which rendered the vehicle illegal or unroadworthy would not be allowed by the insurer. “Thank you for your correspondence relating to vehicles exhausts systems. “I can confirm that under the Construction and Use Regulations (more specifically, Regulation 61A of the Road Vehicles (Construction and Use) Regulations) it is illegal to use a vehicle on the road if it has been modified in such a way that it no longer meets the air quality emissions standards that it had to when originally produced. The law does not forbid modification of the emissions control equipment. It forbids modification that makes the vehicle emit more pollutant than it is permitted to by virtue of the standard to which it was originally approved. Also, that under 8.2.1.1 (petrol) and 8.2.2.1 (diesel) of the Testing Directive 2010/48 now applicable in the UK, a vehicle can be failed if any part of the emission control is absent, modified or obviously defective. However, please note the MOT test is a visual inspection that does not include dismantling of a vehicle or its components. “The law forbids any modification that makes a vehicle emit more pollutant than is permitted by the emissions standard applied to it when it was registered. “We are working collaboratively with vehicle manufacturers to investigate the impact of tampering with emissions control equipment on the emissions performance of vehicles and we refute any suggestion that the Government is covering up this issue. (b) testing the roadworthiness of motor vehicles and their trailers(d). “In other words, there is no substantive transposition of the requirements re exhaust and emissions systems just a change to give powers to the Secretary of State to make them in the future. The Secretary of State makes this clear in a letter dated 14 February 2013 i.e. there is no substantive change to the periodic test (so called MOT) in the UK (attached). Clean Air in London would like the European Commission to confirm whether it considers the infringement should have been closed given the above and second, what evidence would be required to trigger an in-depth assessment by the Commission into the substance of the EU MSs national transposition and inspection legislation. Addison Lee and the City of London Corporation have confirmed they do not remove DPFs from their vehicles. Mayor of London has still not responded to requests from Clean Air in London on Twitter to confirm that factory-fitted DPF’s have not been removed from Greater London Authority Group vehicles and/or other vehicles for which he is responsible. The exhaust emissions standards for new cars have effectively required the fitting of a DPF in the exhaust of diesel cars since 2009 when the ‘Euro 5’ standard came into force. In fact, many cars registered before 2009 will have had one fitted in anticipation of the change in standards. CAL estimates that over four million diesel cars in the UK had or have a factory-fitted DPF with more than one million of those vehicles being outside the manufacturers’ typical three year warranty period.